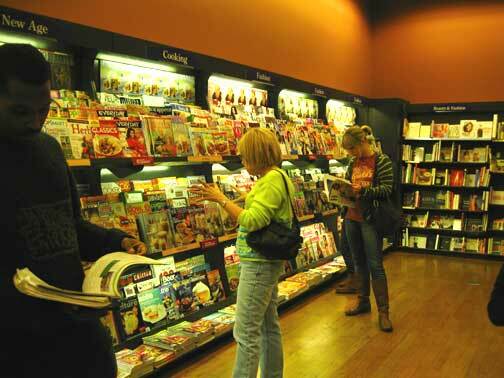 So what can you learn about magazine management in Books-A-Million and Borders that you can’t learn in a classroom? Lots. Linda is a doctoral student in the college who brings to her degree work and her teaching a wealth of professional experience. Before coming to UF to work on her doctorate, Linda worked in three different Meredith Publishing groups. She had been editor-in-chief of the newsstand design group and then editor of Beautiful Homes. Before that she was Homes editor of Southern Living. I asked Linda about the field trip. What is the class that you took on the field trip? Linda Hallam: This is Magazine Management (JOU 4510). I have 12 students, which works well for field trips and class projects. We have three prototype teams of four students each. They are juniors and seniors. Why did you decide to take the field trip to the bookstores? What did you think you’d gain through the trip versus having the same discussion in the classroom? Linda Hallam: I decided to take the field trip because we are working on mission statement and market analysis — what is and isn’t available as far as magazines at average newsstands — and the business plan, which includes distribution. I’m incorporating the business/marketing side of magazines into the class so I wanted the students to see the importance of newsstand placement. They saw incaps, learned what they are,who pays for them, saw the above-newsstand-cover placement at Books-A-Million, etc. Magazines are a visual medium — seeing is everything in teaching. We will be working on covers soon–and we discussed logos, cover images, special packaging (CDs, T-shirts etc. ), blurbs, blurb placement and why blurbs are called “sell lines” in the business. What were some of the learning experiences for the students in going to the bookstores? Linda Hallam: How important newsstand placement is and how it isn’t always logical, i.e. magazines aren’t always placed where you think they would be. And how this can affect sales. Also the huge number of magazines and how they are more and more targeted. We also talked, and I pointed out an example of how cover images can be different on newsstand and subscription copies; same with blurbs. We saw some of the magazines they had used for class projects so we could talk about them. How did you structure the time at the bookstore? Linda Hallam: We “toured” both newsstands as a group. At Borders, I asked the students to choose one home and garden title they would buy and one they choose if free. I did this because of every major magazine company in the U.S. has “shelter” titles and lots of city magazines have lots of “shelter” content. They told the group why they made their choices. At Books-A-Million, after we toured the newsstand, I asked each student to choose one title they would buy and one they would take if free. Students shared selections with the group. We discussed placement, covers, categories etc. as we toured. I try to make the class as interactive as possible, and the students for the most part are engaged. Any advice for someone who is considering such a field trip? Linda Hallam: Make sure the field trip is applicable for the class. My student are creating prototypes so they need to see as many magazines as they can–and too expensive for them to each buy a bunch. And make sure the time and transportation work out. We started 30 minutes later than class time as the students had to drive to the first bookstore (which is in a busy section of town) at rush hour.